Bush subsequently returned to San Jacinto in November 1944 and participated in operations in the Philippines until his squadron was replaced and sent home to the United States. Through 1944, he flew 58 combat missions for which he received the Distinguished Flying Cross, three Air Medals, and the Presidential Unit Citation awarded to San Jacinto. Because of his valuable combat experience, Bush was reassigned to Norfolk Navy Base and put in a training wing for new torpedo pilots. He was later assigned as a naval aviator in a new torpedo squadron, VT-153. 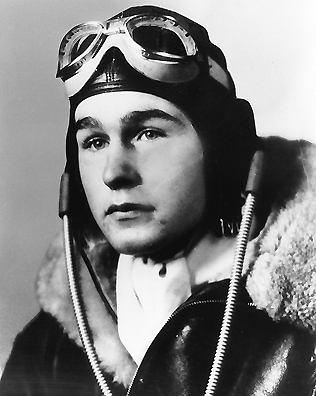 Upon the Japanese surrender in 1945, Bush was honorably discharged in September of that year. The war ended the summer after their wedding and Bush was honorably discharged. He and Barbara moved to New Haven, Connecticut, where Bush began Yale on an accelerated schedule. Bush excelled at sports and captained the Yale baseball team. Two and a half years later, Bush graduated with honors and a degree in economics. While in New Haven, Barbara had given birth to their first son -- future president George W. Bush.